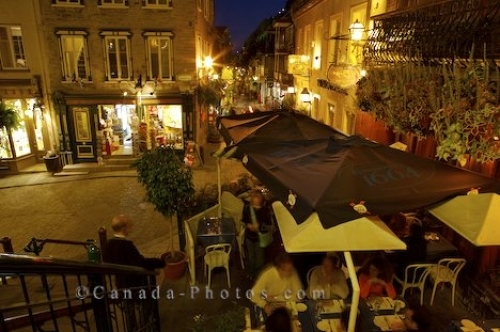 During the evenings, one can stand at the top of the L'escalier Casse-cou or Breakneck Stairs in Old Quebec in Quebec City, Canada, where one can overlook the restaurants and Petit Champlain which glow in the night lighting. Standing at the top of the L'escalier Casse-cou, many know them as the Breakneck Stairs, the view of the restaurants and Petit Champlain in Old Quebec City, Canada is beautiful at night as the area becomes aglow from the lighting. The Casse-cou dates back to the early days of New France and has been located on maps of Quebec City since 1660. Elegant restaurants, unique shops and historic buildings are what makes up this area which becomes fairly quiet during the night but filled with tourists in the day. A summer evening creates the ideal atmosphere to enjoy a romantic dinner on one of the outside terraces. Picture of the restaurants and Petit Champlain at night from the top of the L'scalier Casse-cou in Old Quebec, Canada. ... from the haven of the Cul-de-sac, once home to Chevalier while others believe it refers to the time of the American attack when the soldiers named it the Breakneck Steps or Escalier Casse-cou. These stairs were once wooden and renovations were required in 1968 with alterations being done, now beautifying the area in iron. The Petit Champlain in Old Quebec, Canada has become one of the most populated areas during the summer months. Restaurants and Petit Champlain seen from the top of the L'escalier Casse-cou, Breakneck Stairs, Quartier Petit Champlain in Old Quebec, Quebec City, Quebec, Canada. UNESCO World Heritage Site.